Cut trimmed chicken thighs into large bite size pieces. In a large mixing bowl combine the apricot preserves, vinegar, BBQ sauce, granulated garlic and sea salt. Add the chicken and mix very well to coat evenly. Place chicken and all the sauce in a storage container and marinate for at least 6 hours, overnight is ideal. 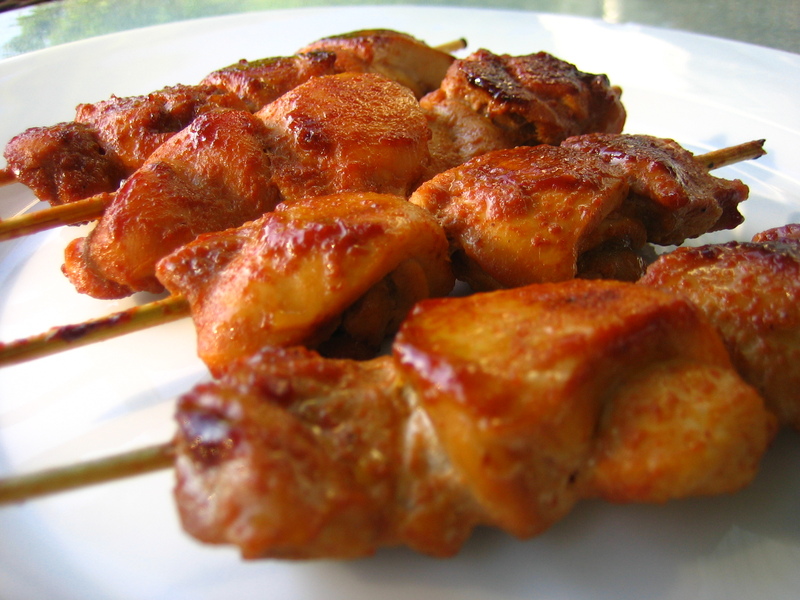 Thread marinated chicken onto skewers (make sure they will fit in your skillet), leaving space at either end of skewer. Heat a large non-stick skillet or well seasoned cast iron pan over medium heat and add skewers. Cook skewers, turning a few times, until chicken is cooked throughout and sauce is nicely caramelized. My trick is to keep adding a bit of water to the pan as they cook, so the sauce doesn’t dry out or burn before the chicken is cooked, then I let the water and sauce dry out a little, so it caramelizes and gets nice and thick. Lastly, swirl the chicken skewers through the thickened sauce to make sure plenty of it sticks to the chicken. Serve these hot, or let cool to room temp. As an appetizer you can put one or two of these on a small plate, with a leaf of lettuce underneath. For a meal, these go great with rice, or roasted vegetables, or boiled new potatoes. We always add a big crunchy salad with lots of colorful vegetables tossed in. Try firm extra cubed tofu or seitan in place of the chicken. Toss together all of the seasonings and rub on fish. Bake for 7 to 10 minutes (bake longer depending on thickness of fish) and turn on the broiler on high and broil until done- an additional 2 to 4 minutes. Given the Asian flair of this recipe, try with soba noodles tossed with steamed sno-peas, lightly sauteed shitake mushrooms, a touch of sesame oil and soy sauce. *We prefer homemade broth to most store bought varieties, especially some of the boxed organic broths, which have way too many flavors added. Our is nothing more than the water left over from when we poach chicken for chicken salad or other chicken recipes. We add a few bay leaves while poaching and lightly season the broth with sea salt. Refrigerate the broth overnight, remove most of the solidified fat the next day and freeze broth in pint & quart containers for uses such as this recipe. Place the onion, celery and carrot in a large soup pot with the chicken broth. Bring to a boil, reduce heat to low, cover and simmer 10 minutes. Add everything else, bring back to boil. Reduce heat to low, cover and let simmer another 5 minutes. Taste and adjust seasonings to your liking, and serve! We garnished ours with chopped parsley and scallions. 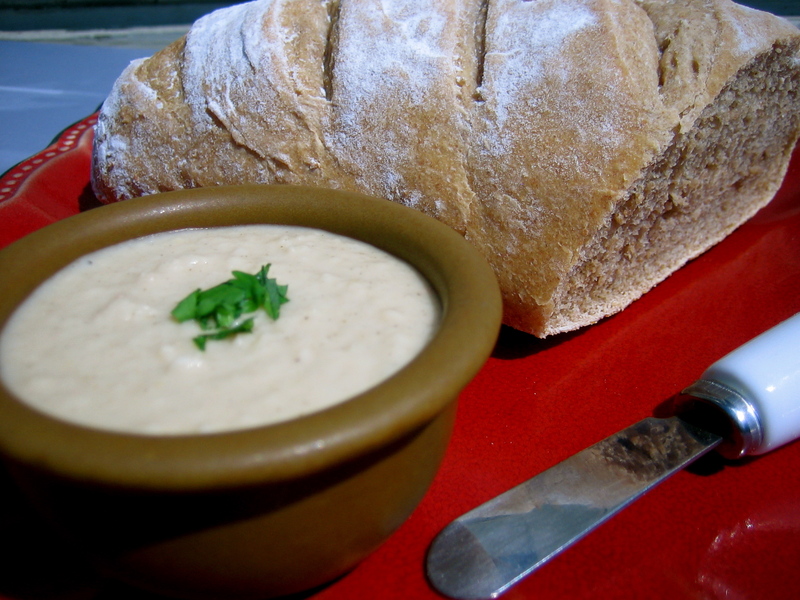 Slices of whole grain bread with a sprinkle of parmesan on top, popped in the toaster oven, was our accompaniment of choice – a perfect combination with the soup! Use your favorite vegetable bouillon or broth in place of the chicken broth. Heat a small to medium nonstick over on medium heat and coat with cooking spray. While pan is heating, beat the eggs using a whisk until fluffy, adding liquid halfway through. Add herbs and salt and pepper. 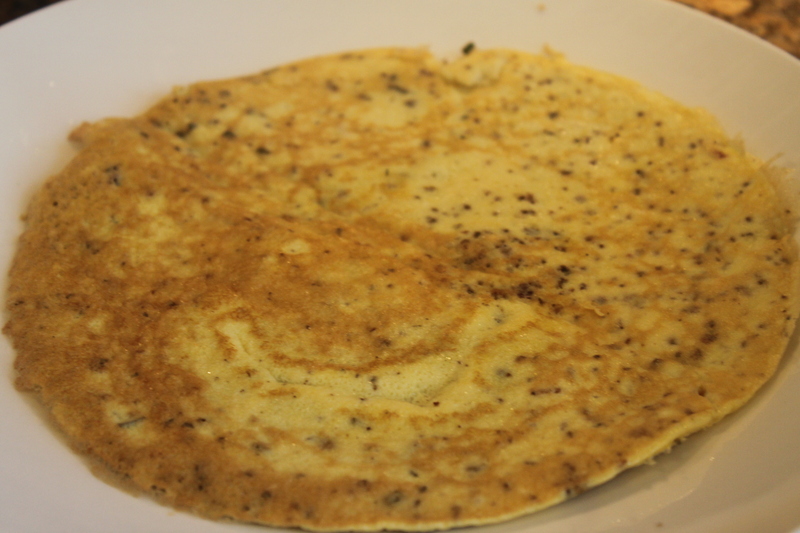 Pour egg batter onto pan, and cook until edges are lightly brown, and the middle is no longer runny. Flip, and cook an additional minute or two. Whole-wheat or Food for Life Ezekiel toast with a dollop of butter is a great starch option. Get your veggies in with a simple salad of romaine lettuce, tomatoes, cucumbers, onions and carrots or any lightly stir-fried or steamed vegetable like broccoli, zucchini or green beans. Preheat oven to 350. Cut all the vegetables into 3/4 inch cubes. Toss them in a mixing bowl with the oil, salt & pepper until evenly coated. Arrange in a single layer in a casserole or baking dish, and cover with foil or casserole lid. 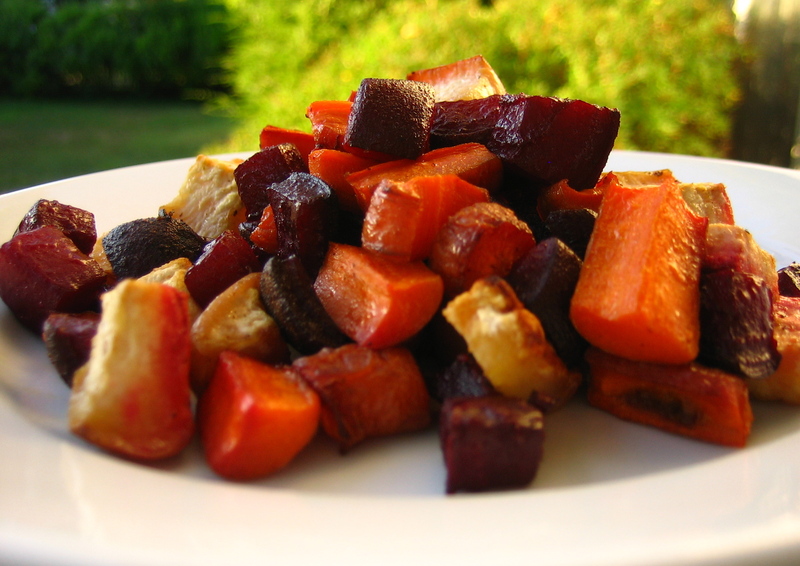 Let vegetables roast, covered, for about 35-45 minutes, just until tender and very lightly browned on the bottoms. They’re ready! You’ve got a classic roasted vegetable side dish here, pair it with herbed chicken or turkey, or try the grilled fish suggestion! 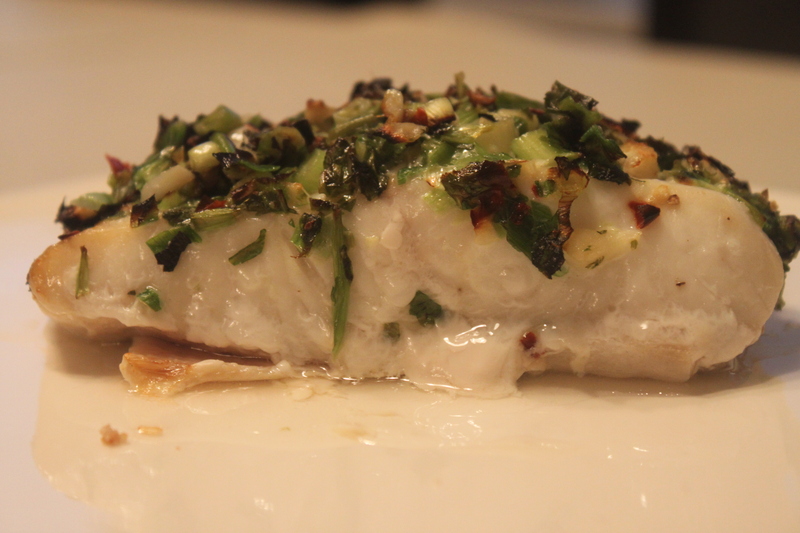 Halibut, tilapia, even a simply broiled filet of sole would be great. These roasted gems would also go very well with the Savory Baked Tofu recipe I posted a couple of months ago. The three of us recently spent a week at a lovely beach house in Malibu with our friends Raj and Aparna and their two kids. The house had a huge backyard that overlooked the sea and was so beautiful that we ended up cooking most of our meals on the outdoor grill and canceled many of our dinner reservations. We all had recipes we tried- more of those coming later- but the grande finale to our cookfest was these tikki’s. 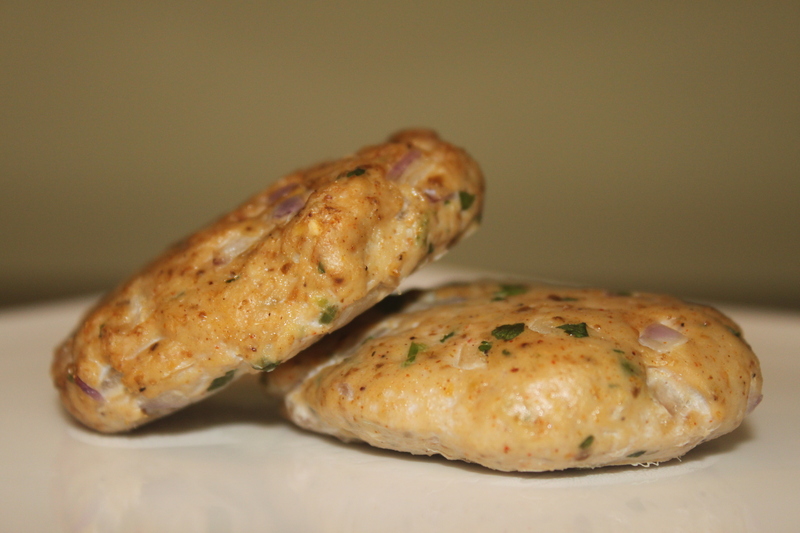 Tikki’s are basically mini-patties, but you can actually shape these any way you like. They are an old family recipe of Aparna’s and were so good that I made a double batch of them within two days of returning from our trip. You can use an oven or nonstick grill pan. If using oven, preheat it to 350 degrees. Roast and grind poppy seeds, coriander seeds and cumin seeds. Bring the meat to room temperature and marinate with the spices, coriander and onions for at least 2 hours. Divide the mixture into 12 to 14 small portions and form into patties, almost like a mini-burger size. In oven, roast for 10-15 minutes or until cooked, making sure to turn over the patties halfway through the cooking. If using grill pan, warm it up over medium heat and lightly mist with cooking spray. Grill for 10 to 15 minutes or until cooked. Be sure to turn over the patties halfway. Tuck into a whole wheat pita and top with onion slivers, coriander or tamarind chutney, mango chutney or ketchup. For side dishes, any steamed or lightly sauteed vegetable will do, but if you want to keep with an Indian theme, try My Mother’s Gobi or the Indian Style Mushrooms and Green Beans. Or, serve these patties as an appetizer with toothpicks tucked in. Cut the trimmed chicken thighs into bite size pieces. Heat the butter in a nonstick skillet (or a well-seasoned cast iron pan). Add onions and sauté on medium heat until lightly browned (about 5-7 minutes). Add chicken and sauté another 5-7 minutes. Add green pepper, spices, salt and 1/4 cup water. Stir to combine everything, cover, reduce heat to low and simmer for 7-8 minutes or until pepper is soft and tender. Add the 1 tablespoon of water mixed with the teaspoon of cornstarch and stir until sauce thickens. It’s ready! Taste and adjust any spices to your liking, add something hot if you like such as cayenne pepper or hot chile flakes, and plate it up! Our classic pairing is with some brown basmati rice and a big salad, but it’s also really good with chapati, or even mashed potatoes! Firm cubed tofu or sliced seitan are both really good in place of the chicken, just omit the sautéing step and add either of these along with the spices and water. Heat barbecue or grill pan to high. Wipe okra dry with cloth. Mix together salt, sugar and all the dry ingredients in a bowl. Add oil to okra in a large bowl and toss well to mix using hands to get the okra well oiled. Add the spice mix to the bowl and toss well to get the spices to adhere to the okra. 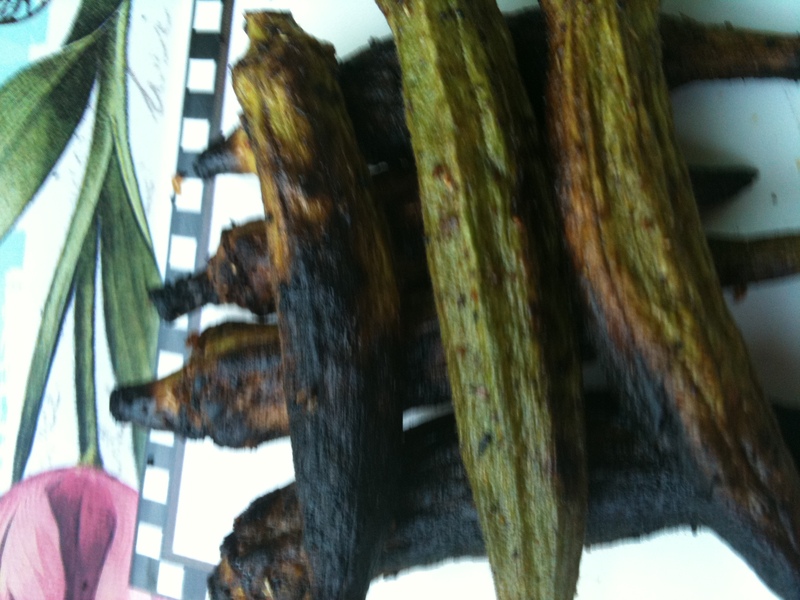 Using a vegetable grilling mesh or a cookie cooling rack (sprayed well with oil) spread the okra in a single layer onto the barbecue or directly onto the grill pan. 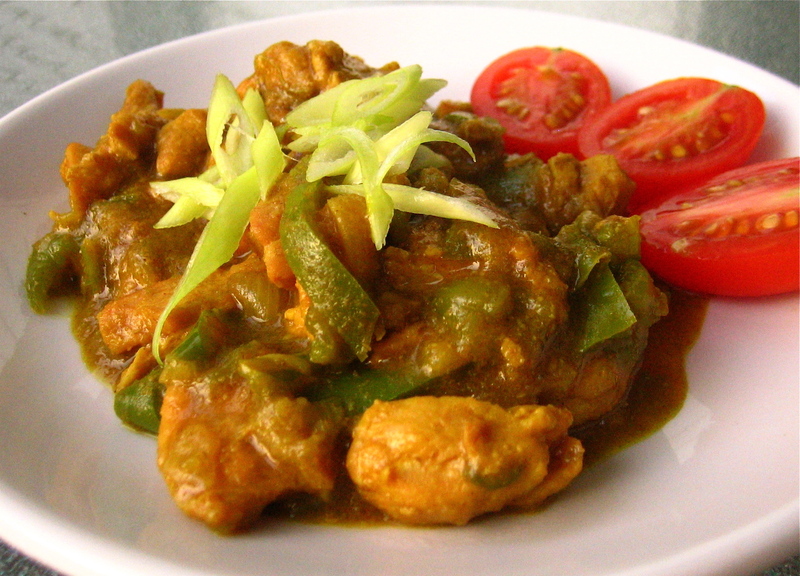 Try this dish with any type of grilled chicken, fish or meat. They would also be ideal with the Turkey Kebabs I wrote on a few weeks ago. Put everything in a food processor and blend until smooth and pureed, adding water in very small increments to make a good creamy consistency. Taste and add a bit more garlic, lemon and/or salt to get it just the way you like it. 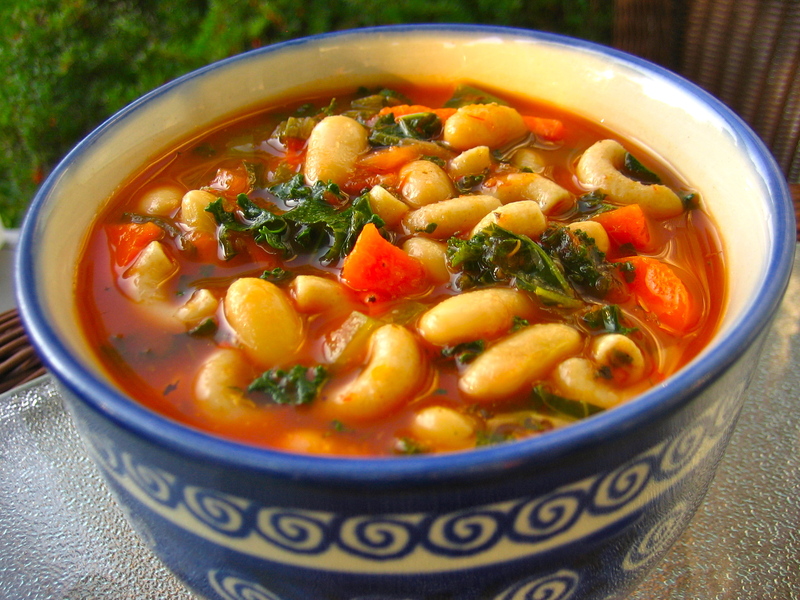 Spoon into a serving dish and garnish with a bit of chopped parsley, or fresh sage if you’ve got it! This spread is best when served at room temperature. Freshly baked whole grain bread is our favorite match, but crackers, pita breads or fresh vegetables are very good too. The spread and bread ensemble travel well – great for taking to a picnic! For lunch or dinner, serve the spread and bread ensemble along with a big salad – spicy arugula with a simple balsamic vinaigrette topped with a few shaves of Asiago cheese would be divine.